BURN MORE CALORIES WITH BODY HEAT: Want to achieve weight loss? It’s quick and simple - wear the Hot Belt, complete your workout routine, and see results. The belt raises your internal body temperature to make you sweat more, and in turn, burn more calories which means drop down in size healthy and rapidly. Hot Belt greatly decreases water weight and releases fat toxins, leaving your body toned and strong. Flat abs, firm stomach, and inches lost are all within reach! UNIQUELY ENGINEERED DESIGN: No more embarrassing sweat stains and odor while you're working out. The Hot Belt's unique moisture wicking fabrication is designed to repel moisture, keeping you dry on the outside and comfortable for your entire workout. Better yet, the anti-microbial properties prevent bacteria build up so you don't have to worry about unpleasant smells. TAILORED FOR COMFORTABLE FIT: Made from 100% latex free neoprene, the black Hot Belt has excellent stretch properties that allow it to move with your body no matter what activity you're doing. Its ultra thin fabric still has the ultimate thermal increasing properties, meaning it won't be bulky like other shapers. As a bonus it provides comfortable compression for good lower back and core support. It also hugs nicely around your waist and acts as an ab trainer. 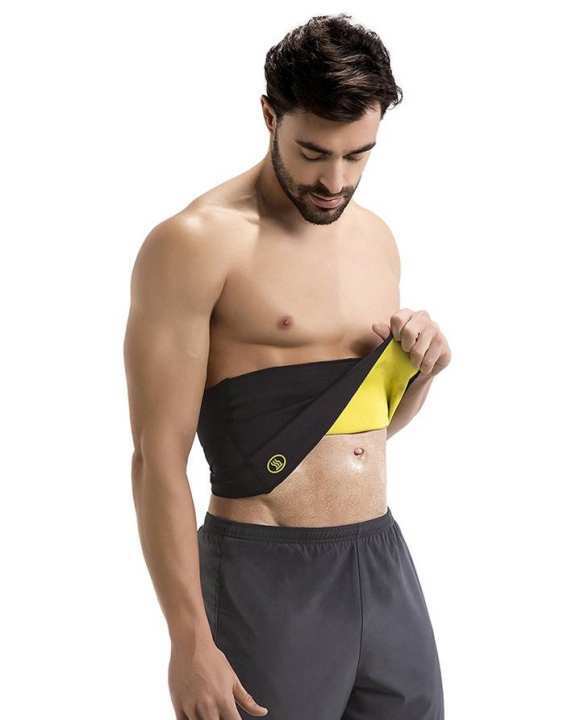 ALL DAY WEARABILITY: The design is seamless and discreet, making the Hot Belt appropriate for in and out of the gym. It works no matter what kind of activity you're doing. Slip into the hot belt as it wraps around your abdominal area and is completely unnoticeable under clothes. Whether you're at the gym or not, you'll still be burning away those calories in this sauna wrap. extra large (xl) size mangwaya tha 28 size bhej diya kya 28 aur 38 me koi farq nahi logon ko lootna aur bewaqoof banana band karen band kar daraz.pk. yeh bataen ab yeh change kaise hongi.theli per XL ka sticker lagane se size XL nahi ho jata jiski qamar 28 hogi wo belt kyon khareede ga. jo belt nahi sell ho rahi wo daraz.pk per bech do bada acha tareeqa hai.yeh belts change karke sahi size den ya phir mere paise wapas den. me yahan gandi gandi gaaliya bhi likh sakta tha lekin online parhne walon ka ehtraam kar raha hon. I asked for xxl but i recive small size..waste of money ..not even one star is suppose to be given. I have waist of 38. Which size will suit me best.